Some of those assisting with the clean-up effort in Cumbria have first-hand experience about just what it is like to be flooded. Mother-of-two Heather Shepherd was herself flooded nine years ago, at her home in Pentre, near Shrewsbury in Shropshire. She is now Community Groups Co-ordinator for the National Flood Forum, which provides support and advice for the victims. Speaking from Cockermouth, she said it was "really early days" for people whose homes were currently uninhabitable. "For those who may move into a caravan temporarily, there will be mixed feelings. "There'll be relief at having somewhere to go that's warm and clean, where they can get food and drink in a comfortable environment. Apart from a death in the family, I don't think there's anything worse than flooding. "But it isn't your home. I was in a caravan for over a year with two children, which can be exciting for them at the start. People stay in caravans for holidays, of course, but after two weeks it's not a holiday any more." Mrs Shepherd said people would be faced with an initial expenditure, after they find that basic items such as cutlery, crockery and foodstuffs are no longer to hand. She also said the hardest part was handling the aftermath of the disaster. "Dealing with builders afterwards can be even more stressful. Apart from a death in the family, I don't think there's anything worse than flooding. "It's something that doesn't leave you for years. I've never forgotten what happened to me, I just lock it away in the back of my mind." Kim Suttle is Allerdale Borough Council's representative on the multi-agency group organising relief for those affected by the floods. She said it was "too early to be able to predict numbers as people were only allowed back into their homes on Monday", and that the council was awaiting phone calls to request accommodation. "So far, the group has been able in the cases of around 80 vulnerable people - some elderly, some with learning difficulties - to get them back home or into alternative accommodation for the longer term. "We have made arrangements to help meet the accommodation needs of other vulnerable people and are continuing to work with the county council's adult social services team and local housing associations, amongst others." 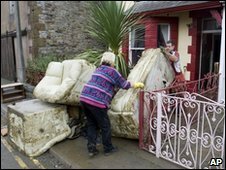 Ms Suttle said that anyone who needs accommodation as a result of the floods should contact Allerdale Borough Council. "We will be able to offer a range of options... about available properties, much of which has come forward from generous offers from the public in response to the situation."